At Anchor we know that concerns about money can be a particular issue for older people who are managing on a low fixed income. Traditional ways of managing your money and services, such as post offices and high street banks are fast changing. As the use of the internet grows, many post offices and local bank branches are closing, reducing the availability of face to face counter services. And for many, retirement and older age are presenting new financial pressures. Even if you have a healthy income coming in from pensions or investments, it’s always useful to review your finances and outgoings to see if you can make your money go even further. Anchor sees money management as an aspect of wellbeing for older people and aims to assist the people living with us to manage their financial affairs more effectively. Financial advice is available from a range of sources nationally and locally. Some organisations can provide free financial information and advice, whereas others, such as independent financial advisers will usually charge. The following websites and advice lines are a good starting point when looking to review your finances. Gov.uk has a range of information on planning for retirement including information and advice on pensions, tax and benefits and staying active in older age. 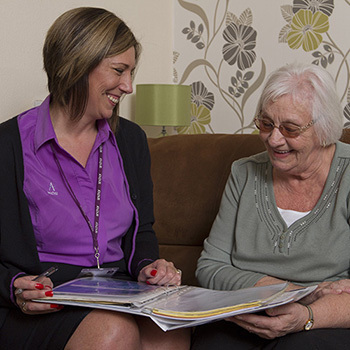 FirstStop Advice is an independent, free service offering advice and information for older people, their families and carers about housing and care options in later life. It is led by the charity Elderly Accommodation Counsel (EAC) working in partnership with other national and local organisations. Visit the FirstStop website or ring 0800 377 7070. The Money Advice Service is an independent service, set up by government to help people make the most of their money; they give free, unbiased money advice to everyone across the UK – online, over the phone and face to face. Visit the Money Advice Service website or ring 0300 500 5000 for information and advice on financial planning for retirement. If you are struggling with debt and don’t know where to turn for help their Debt Advice Locater tool can be particularly useful. Independent Age is a national advice service for older people, their families and carers providing information on benefits and entitlements, paying for care, and much more. Visit the Independent Age website or call 0800 319 6789 Monday to Friday 10am-4pm to speak to one of their advisors. Age UK is a national charity that offers information, advice and guidance on a range of money matters in later life. Visit the Age UK website or ring 0800 169 6565. Turn2Us is a free service that helps people in financial need to access welfare benefits, charitable grants and other financial help – online, by phone and face to face through its partner organisations. Visit the Turn2us website or ring 0808 202 2500.